At last Saturday’s pruning workshop by The People’s Orchard I was talking with some people from Fishguard. They’re interested in creating a forest garden but they’re in an incredibly windy spot by the sea. There is nothing like a challenge to get the brain working. Forest Garden Wales is a good 7 miles from the sea, so although we have a lot of wind, being at the top of the valley, we don’t get any salty sea wind. Which is handy, because I really like Amelanchiers (Juneberries), and apparently they don’t tolerate maritime exposure. 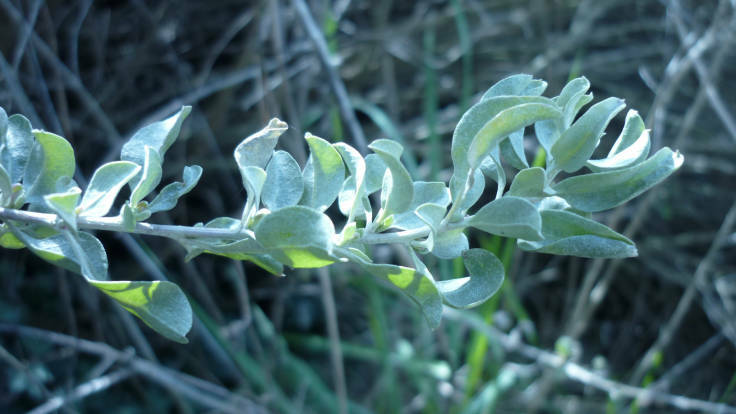 Saltbush (Atriplex halimus). Even when grown in non-coastal sites, it still tastes salty! Gorse (Ulex europaeus). Fantastic pollinator plant, year round flowers in some places, plus you can make wine from the flowers. Spiky. Some people don’t like it. Japanese Barberry (Berberis thunbergii). Lovely, spiky evergreen Barberry. Broom (Cytisis scoparius). Pea family, great pioneer plant, nitrogen fixing. Autumn Olive (Elaeagnus umbellata). Brilliant nitrogen-fixing, berry-carrying 5 metre high star of the show. Hawthorn (Crataegus spp). If I had to have a favourite small tree, this might be the species for me. Great for pollinators, beautiful, hardy, easy to grow and to graft. Italian Alder (Alnus cordata). Maybe a bit big for a permanent hedge, and doesn’t coppice well (I think). Though great pioneer species and superfast growing. Our 3 year old specimen is now about 5 metres tall. ‘Bowles hybrid’ Willow (Salix). Upright, well-behaved, fast-growing willow. Haven’t grown it myself but itching for an excuse to plant some. Sea Buckthorn (Hippophae rhamnoides). Classic plant for coastal areas, as its name suggests. Nitrogen fixing, good for stabilising loose ground, edible berries that taste of a pleasant battery acid (though high in vitamins). Hopefully that may give some windswept sea folk a bit of inspiration.